If you look at several different nanny job descriptions, chances are each one will require different things of the nanny. This is because there isn’t a standard nanny job description, and each position will require unique tasks of the nanny based on the family’s needs. However, there are generally accepted parameters, as well as things that a typical nanny does and doesn’t do. In general, a typical nanny’s job description includes tasks related to the care of the child; things like laundry, light housekeeping of children’s areas and preparation of the child’s meals are common requirements of a nanny position. 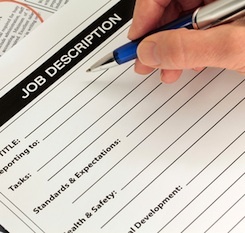 There are also some things that are generally considered outside the accepted job description. Here’s a list of the one’s most often wanted by parents. General housekeeping. There probably isn’t a more confusing term in the nanny field than the term “housekeeping.” Some parents use the term to mean child related tasks while others use it to mean full housekeeping. Because of the lack of a solid definition, it’s become a red flag to many nannies during their job search. So what type of housekeeping is part of a nanny’s typical job description? Technically, anything related to the care of the child is considered part of the nanny’s job. That could include changing the sheets in the child’s bedroom along with dusting, vacuuming, sweeping and mopping the rooms used by the child, like the playroom. General or heavy housekeeping is not part of a typical nanny’s job description. This type of housekeeping includes things like cleaning the bathroom, scrubbing the stove and dusting the mini blinds. Generally things that would be done by a regular housekeeper aren’t included in a nanny’s job description. Watching additional children. Unless she’s hired to work a nanny share, a nanny is hired to care for the children of one family only. It’s not her responsibility to care for a schoolmate while the child’s mom does errands or to watch over all the neighborhood kids during the summer months. Of course, part of a nanny’s job is to foster her charge’s social development, and that means hosting and participating in regular play dates. However, when those play dates become one-sided, when they’re with children who are much older or younger than her charge or when an adult isn’t readily available to come get the play mate, the play date has turned into extra babysitting. Pet care. If you have an adult dog that needs to be let in and out during the day so he can enjoy your fenced in backyard, your nanny will likely be happy to do that. That simple task isn’t an official part of the nanny’s job description, but it’s one of the many tasks nannies do just because it’s common courtesy. However, other pet related tasks aren’t part of the typical nanny job description. Nannies don’t automatically take on things like cleaning out the kitty litter, walking the dog during the day or housebreaking the new puppy. That doesn’t mean your nanny won’t help out with your pet. If you need pet care, outline your needs and ask if she’d be willing to pitch in. Family laundry. Although many nannies take on this task, it’s not a standard part of the nanny job description. Your nanny is fully responsible for your child’s laundry, including his clothes, linens and towels. However, taking on your laundry is a task that’s outside of the nanny’s domain. Again, that doesn’t mean your nanny won’t take on the task if asked. It just requires a conversation. Family cooking. It’s part of a nanny’s job to cook healthy snacks and meals for her charge. However, it’s not part of her job to grocery shop or cook for the whole family. Being your personal assistant. It’s easy when you have someone working in your home to ask her to do some of the things you don’t have time for. It’s a lot easier for her to run to the pharmacy and pick up your prescription refill, stop by the grocery store and grab the needed ingredients for dinner or wait on hold to dispute your credit card bill. Unfortunately, those jobs aren’t included in a nanny’s job description. She’s there to provide childcare and related tasks. While those other things can make your life a lot easier, they’re better suited for a personal assistant. While none of those things are typically in the nanny’s job description, that doesn’t mean you can’t include them in your nanny’s job description. It simply means you shouldn’t expect her to take them on without first talking it over with her and also paying her fairly for the extra work.